Can James Rodríguez One-Up Himself And Lead Colombia Even Deeper Into The World Cup? Colombia have talent all over the pitch. Their back line is led by two young and already studly central defenders, their midfield options offer a good mix of defensive solidity and experience with attacking verve and youth, their striker is great and so is their right winger. So it’s not like James Rodríguez, the centrifugal force around which all the rest of Colombia spins, is out there on his own. Still, if Colombia are to replicate or surpass their hella fun run in the last World Cup, Rodríguez will need to be the one who makes it happen. It’s a little startling to realize that Colombia’s last World Cup was their best ever. 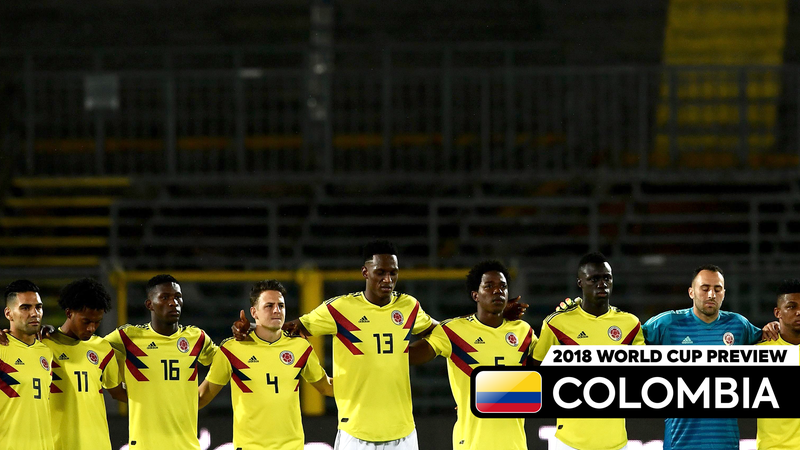 That’s because, in light of their recent pedigree and the legendary figures of their past like Carlos Valderrama and Faustino Asprilla, it’s easy to forget that Colombia aren’t historically mainstays on the international soccer scene. Colombia have failed to qualify for more World Cups than they’ve played in, and the Russian tournament will only be the sixth World Cup in their history. At the big show, they’ve only made it out of the group stage twice, and the run in the 2014 World Cup that took Colombia to the quarterfinals was the deepest they’ve ever gotten. Colombia don’t have much World Cup history, but they can make even more of it this summer. Like any national team in a period of great success, Colombia’s triumphs of late are thanks to the fortunate confluence of events that gifted them a number of all-time great talents. The golden generation that supplied the Cafeteros with the bulk of their core squad players includes guys like Radamel Falcao, Juan Cuadrado, Carlos Bacca, David Ospina, Christián Zapata, and Carlos Sánchez, all of whom are right around 30 years old. Each of those guys are amongst the very best players in their respective positions that Colombia have ever produced. Add in the younger and even more talented James—who’s just 26 years old and is arguably already the best Colombian player ever—into that mix and it makes sense how Colombia have accomplished what they have in recent years. If Colombia are to put together a World Cup that matches up with the last one, it will be because James makes it so. His teammates are good, some of them are even great, but he is the only special player. Moreover, James is the only real playmaker included in any of Colombia’s predicted starting lineups—a fact that makes it even more imperative for him to have a great tournament if his team has any hopes of getting to the first knockout round and beyond. Of course, Rodríguez is more than up for the challenge. As a known but still under-heralded 22-year-old four years ago, James exploded onto the scene in Brazil and captured the imagination of all who watched him. The fresh-faced kid with the million dollar smile revealed himself to be a total killer, scoring and assisting and winning and dancing his way to the World Cup’s Golden Boot award and claiming the unofficial title as the tournament’s breakout star. And while the subsequent years haven’t been quite as bright for James as that World Cup performance portended, he’s finally back to his best self at club level, perfectly primed to launch himself into yet another stratosphere of stardom and Colombia even deeper into the tournament. You can be sure that James is ready for this. Let’s just hope we’re ready for him, too. By the end of July of 2014, James Rodríguez was on the top of the world. He’d gone to the World Cup and made it his personal stepping stone into true international stardom by scoring six goals and setting up two assists, earning himself the right to look every single player at the tournament square in the eyes and definitively say “I was way better than you in Brazil” other than some guy named Lionel Messi. James’s goal count was the most in the competition and one of the ones he’d scored was one of the single greatest goals the World Cup had ever seen. On the back of those performances he’d gotten himself a move to the land of superstars, going from Monaco in the French league to the most famous club in the world in Spain’s Real Madrid. Everything was looking up. Since that point, James’s time in the game has been marked by more frustration than joy. James was a key player during his first season in Madrid, and was just about as phenomenal as expected. The subsequent two seasons, though, saw James relegated to a bench role. This was good for Madrid. Sitting Rodríguez on the bench worked (Real won the Champions League two years in a row with James as a rotation player), and it was an easy shorthand for just how ridiculously stacked Real’s roster was that James goddamn Rodríguez couldn’t even start for them. Clearly this was a bad situation for Rodríguez himself, though. He played consistently well when he did get on the field, but he didn’t play anywhere near as often as a player of his caliber deserved to. Luckily, Real and Rodríguez finally agreed to part ways last summer and James got a move to Bayern Munich. At Bayern, James is back to being James. James is an insane playmaker. The quality with which he can hit the ball cleanly and with power makes his left foot a surgeon’s scalpel, able to slice through defenses with killer passes or smash the ball into the back of the net with a shot of his own. As you can see in the video above, Rodríguez is great at corralling the ball, analyzing the opposition with just a glance, choosing the most threatening available passing option, and getting the ball there, all in a matter of seconds. Speed of execution in moving the ball is just as important as the ability to get the ball where it needs to be in the first place, and James needs no time at all to see and play dangerous passes. He’s apparently struggling some with a calf injury that kept him on the bench for Colombia’s first match of the World Cup, but hopefully he’ll be able to overcome it. Colombia will need his creativity, and we could all use his talent. At his best, there’s only a handful of players in the world who are better. Colombia play a very direct style. They try to get on the ball, look up, get it to James, and let James spring one of his attacking teammates as quickly as possible. Radamel Falcao will wrestle with center backs and stretch the defense with his threat in behind the defense, and Juan Cuadrado will push out wide on the right to keep the defense from getting too narrow. These movements will free up space for James in the middle, where he can be most deadly. James really is the key player for Colombia, as he’s their only real playmaker when he’s on the pitch. The other forwards are more direct runners, and the deep midfielders aren’t great passers, so James and James alone will be tasked with the business of creating chances. If Rodríguez’s injury keeps him out, as it has in Colombia’s first match, it’ll be Juan Fernando Quintero stepping in as the playmaker. Quintero is basically James Jr., down to the fact that he was intended to take over for James at Porto after James left for Monaco. Quintero never really blossomed in Europe the way he was expected to, though a recent return to South America first in Colombia and now with Argentine club River Plate has revitalized his career. Against lesser opponents, Quintero can do a respectable James impersonation. Besides direct attacks at speed, Colombia’s other big attacking threat will come from set pieces. James’s deliveries from dead ball situations are great, and in Falcao, Davinson Sánchez, and Yerry Mina, they have three big, strong guys who are good at attacking with their heads. If Colombia can cadge together enough goals through James and Falcao and keep their opponents from scoring with their young, strong, and fast defenders, the Group H favorites have a legit chance of making some real noise in the knockout rounds. Will Japan&apos;s Experience Be Enough To Spring A World Cup Upset?